Start optimising your profits today by transforming could be customers into regular buyers with 5 great Web Push Notifications. 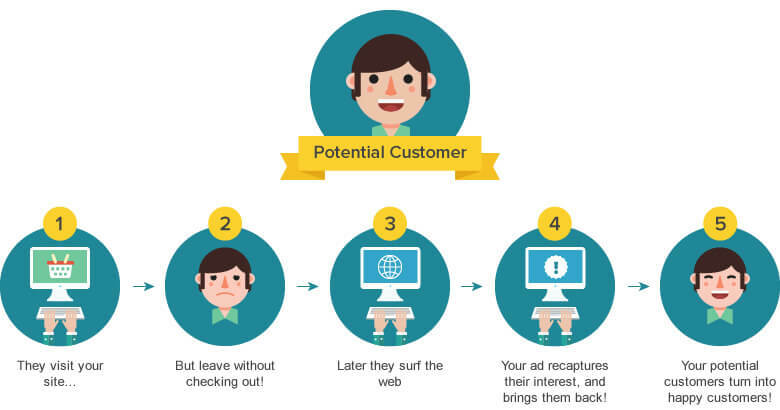 Ok, so what is retargeting? It’s pretty simple, it is using online marketing channels to turn would be customers into happy shoppers. The best way of explaining how it works is with this little diagram. 6. They go back to your store and, viola! you have another happy shopper! Most retargeting uses a little bit of code on your website that records when someone visits. This code most often then drops a browser cookie, and when that visitor then later surfs the web this lovely cookie will let your retargeting provider know that now is the time to send an ad. This is why you find ads for products in your browser that you were searching earlier that day. And why retargeting is a great tool, as it tailors ads that match exactly your potential customer’s wants. Of course, it can’t get them to your site in the first place, but it can help push those pesky abandoned carts through the checkout with a loud kerching! And when you bear in mind that around 68% of carts go abandoned, and that, in general, only 2% of site visits end in a sale, you can see the value here. There are a number of different views on this. The most basic difference is that remarketing is a deeper approach. Think re-engagement emails, and what is the focus of today’s blog - Web Push Notifications, which are a bit of both. Remarket/retarget with Web Push Notifications. Web Push Notifications offer all the value of a banner along with the tailoring/segmentation value of a remarketing email. Unlike a remarketing email, they are, like banners, browser based, so they don’t suffer from such problems as spam filters or inbox inertia. Once someone has subscribed to receive your pushes, they can be sent to them wherever they are on the web, at any time of the day. And better still, they can be segmented so that they fit the profile of each potential or returning customer, making them more effective than banners. Most Web Push providers offer a number of pre-installed Pushes. Which are the best when it comes to retargeting? You already know how much of a nuisance abandoned cart is. But let’s not think of them as lost sales, but as potential profit. A good abandoned cart remarketing Push Notification can give you a cart to sale conversion rate of 7%. And with Push Notifications, the ROI is win win. There is no need to create copy or invest in a programmer - an App like Firepush comes with pre-installed messages. All you have to do is make sure that each visitor to your website signs up to receive your pushes. And with such options as automated sign up boxes, which users are prompted to sign up for when they visit your site, gathering subscribers need not be a headache. How do Abandoned Cart Pushes work? Well, like Abandoned Cart Remarketing Emails, they are sent to subscribers who have left purchases at your checkout. But unlike the emails, they are guaranteed to be seen by your potential customer as they are sent directly to them via their browser. Abandoned cart pushes can be timed to hit your customer at intervals from 12 to 48 hours after they have left your checkout. You don’t want to bombard your customer, but you also don’t want them to forget you. These pushes can be sent to your customers based on their previous browsing and purchase history. You can use them to re-engage all potential purchasers and lure them back to your shop in search of a great deal. Pretty much does what it says. This push lets your customer know when that in demand item is back in stock. For your shoppers, this push drives great value as it can be used to send them alerts and updates on the delivery of their purchases. Here, the real value is re-engagement as you are showing your customer that you really care, and that quality of service is your number one concern. These are mass mailout pushes that go to all of your Push subscribers. In them, you can incentivize using a discount, a one-off gift or reduced postage, in fact you can go with whatever you think might drive sales. They are not segmented, so are not as tailored as the other Pushes on offer, but they do have the advantage that they are perfect for catching and converting impulse buys. So, there you have it. A suite of great Push Notifications that can be used to re-market and re-target your store. Of course, successful retargeting and remarketing depends on you finding out what’s the best combination of strategies and channels for your store. For the best result, why not try a mixture banners, remarketing emails and Web Push Notifications, and test the results. Be creative, be dynamic, and put the time in. If you do this, you’ll soon find a solution that will help you optimise your sales potential, and get those profits growing.